If business is going down, why are customers ignored? For the past few years whenever any discussion or casual talk on how’s business comes up the standard reply we hear is business is down, revenue has come down, the market is tough… so goes the list of woes. In such a tough market scenario when you are losing business you would think that a customer would be treated like royalty by any business. Yet what has been your experience as a customer? Were you treated well, if not like royalty at least with courtesy and respect? Studies have shown that ignoring existing customers can lead to higher customer churn and loss in profit and revenue. Have you experienced any of the following scenarios? – You go with the intention to buy a product, but you leave without buying as there are no staff to properly attend to you. – You call a service centre/call centre with a problem and you get connected to an automated answering service during working hours where the number to press to connect to a call agent is given last. One of the leading bank’s call centre automated answering service gives the number to connect to a call agent the very last, after even saying the number to press to disconnect. It’s almost as if they don’t want you to disturb the call agent! – When was the last time you received a thank you for giving your business to a company? We often wonder whether the management of most companies are even aware of the above scenarios on how a customer who walks-in or contact is treated. With the proliferation of social media, it is quite easy for a customer to give you a bad review in Google or social media which has a far-reaching damaging effect on future customer acquisitions. This scenario brings us to the question, if the business is going down why are customers ignored? How many businesses take the effort to speak to their customers, to know how a customer rates their product/service, how satisfied the customer is with their service. How many take the effort to retain a customer even though it is a known fact that it is more expensive to acquire a new customer than to get repeat business from an existing customer. Do you think the majority of the businesses are paying attention to what their customers think and feel about them? No, instead, when business is going down where do they pay attention, to reduce expenses. And what action is taken – reduce the budget, and which gets cut first – marketing, of course! By reducing the marketing budget, you further reduce your channels of communication with the customer. And the customer gets pushed further away. The downward slide of the business continues, and the customer gets continued to be ignored. 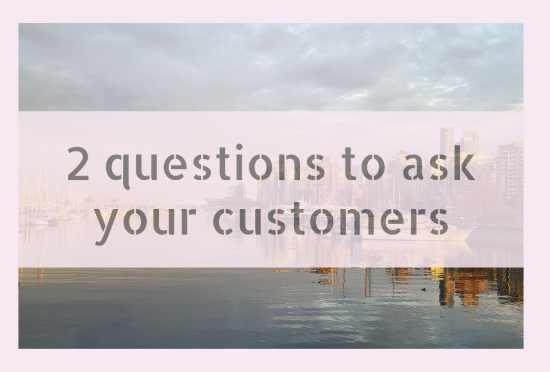 There are two critical questions every business should ask their customers. These are two important customer metrics that portrays how your customers think and feel about your brand/product/service. Just two questions to be asked and still, no business has the time to do that. Or could it be that they are not aware of the significance of these questions? This metric measure how happy your customers are with your brand/service. All you need to do is ask your customers, how do you rate your overall satisfaction with our brand/service on a scale of 1-10 or on a scale of Excellent – Poor. It’s clear and simple to administer. This metric measure customer loyalty. It gives an indication of future customer engagement. To get your NPS score, subtract your detractors from promoters, divide by your total respondents and multiply by 100. NPS is a good indicator of your future sales and customer satisfaction. So, if your business is not doing great, focus on your customer base and talk to your customers. 1. Ask the above questions on a brief survey in social media, or on the phone or face-to-face when customers visit your outlet. 2. Based on these customer metric scores formulate your marketing strategy to acquire and retain more customers. 3. Provide customer service training to your sales and service team to improve the score of the metrics. Reward and incentivize the staff who not only makes customers happy but also delights them with his/her service. 4. Get testimonials or reviews from your happy customers which build up trust and credibility in your brand/service enhancing your performance. Why online advertising is important for future business success. How email marketing can help you grow your business.